Project Beautiful - Inside and Out is honored to have supported award-winning photojournalist Linda Solomon's Pictures of Hope program at The Shelter of Flint this November. 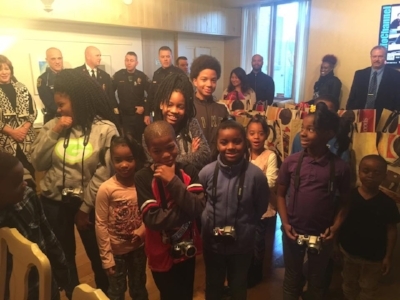 Pictures of Hope gave cameras and a photography tutorial to fifteen children from the shelter. Mentors from the community then helped each child write down and capture in film their hopes and dreams. The photos were made into greeting cards as a fundraiser for the shelter - $20 for a box of 15, available here. The media attention of the program has helped many of the dreams get fulfilled, including full-ride college scholarships! We were excited to support the program at the "Meet the Young Artist Celebration" on November 21, 2016 with special gifts of hope for the children's parents. 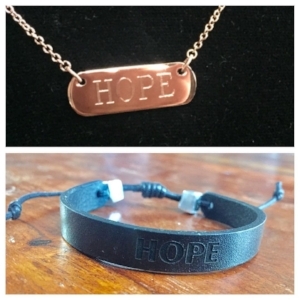 The gifts included: a "Hope" necklace for the moms and "Hope" leather bracelet for the dads, Kroger and Visa gift cards, new winter hat and gloves, perfume / cologne, beauty and personal care items, and chocolates (valued at approximately $150). Project Beautiful - Inside and Out also made a lasting donation to the Shelter of Flint of five crib and mattress sets (valued at $750); previously babies were sleeping in pack-n-plays. Our goal is to continue this partnership with Linda and Pictures of Hope as she travels around the nation with this amazing program! Being interviewed by Angie Hendershot of ABC12 Flint! Doris with retired NBA Basketball star and Flint native, Morris Peterson Jr.! Doris with Morris Peterson Jr. and SuperTalk 157o Co-hosts Candice Montie (left) and Kristen Wolosonowich (right). Executive Director, Doris Gilles, discussed Project Beautiful - Inside and Out's participation in the Pictures of Hope program on ABC12 Flint and on the AM Radio show "The Dish"! HERE is the appearance on ABC12 Flint. Doris is in the segment called "Flint Children see Their Dreams on Christmas Cards." HERE is the radio interview on "The Dish" - SuperTalk 1570.